Home / Uncategorised / How Does Acupuncture Work? We are often asked how on earth putting a few needles in to a muscle can possibly work? Western acupuncture (also known as dry needling) works by stimulating the nerves under the skin and muscles of the body. This triggers the production of normal substances in the body, such as pain relieving endorphins, which provide the beneficial effects of acupuncture. This can help with conditions such as chronic neck pain, migraine and muscle and joint pain. 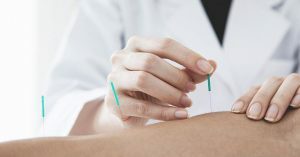 This type of acupuncture is used by us at Offington Osteopath Clinic in conjuction with other osteopathic techniques.